Get a smooth cut finish with a sharp point fast! - Are you tired of using awkward manual pencil sharpeners ? - Is your current sharpener too heavy, bulky and noisy ? - Do you struggle to get the perfect sharp point on your pencils ? 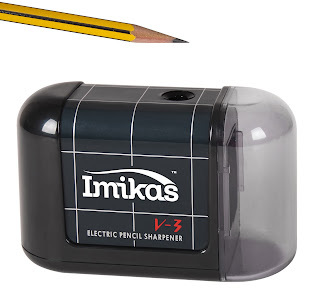 Introducing the Imikas Pencil Sharpener Battery Operated! Amazon buyers trust our Imikas Brand for Quality, Premium Products. This is a great little sharpener. My son's in 4th grade and we go through pencils a lot. It's a lot better to have an eletric sharpener than a manual one. It's easy to use, the blades are sharp and sharpens the pencils quickly. The pencils come out with a nice point. It's a good size, compact and sturdy yet lightweight. I love the safety feature which cuts off the power when the tray is removed. The only downside some people might not like, is that it does take 4-AA batteries. Which might seem like a lot for a small pencil sharpener, but it doesn't bother me because I believe it helps with the power of the blades. Overall, I'm very happy with this product. If you would like to try this ImiKas Battery Operated Pencil Sharpener for yourself, you can purchase it right now from Amazon!